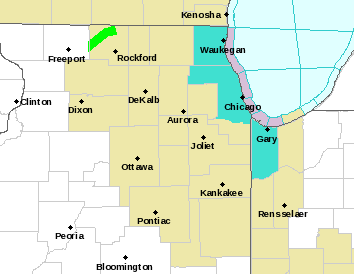 CHICAGO --- A Winter Weather Advisory went into effect for Cook, DuPage and Lake counties at 6 p.m. on Monday. The advisory remains in effect until midnight. The Winter Weather Advisory remains in effect until midnight tonight (purple-shaded area on map below). Wet snow continues north of Interstate-80 in northeast Illinois this evening with temperatures right at 32-degrees accumulations of 1 to 2-inches have caused slushy/slick spots on highway and local streets/sidewalks resulting in hazardous travel conditions. Scattered rain showers are occurring south of Interstate-80. There could be some remnant drizzle, but for all practical purposes the wet snow/rain will have moved east of Chicago by midnight. 6PM: Rain has just flipped over to snow in Crystal Lake.